In a rare flurry of frivolity, and cos they’ve been on the telly, we wanted to give Manchester House or The French a whirl, but it turns out they have better things to do on a Monday than feed us. 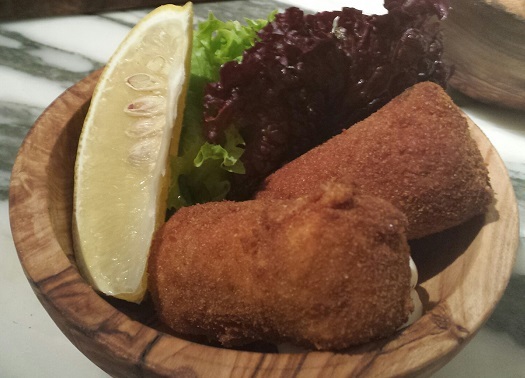 San Carlo Cicchetti got the nod. It’s hustly and bustly and shiny and solid and there’s a heavy fug of earthy damp in the air. We pondered that said fug may have been emanating from the Ladies-Who-Lunch table next to us, but later learnt it was down to what can only be described as a Carpe Diem approach with the truffle. No complaints from us, mind. It’s one of those “order some stuff and we’ll bring it when it’s ready” places, which is a nice little gift from a restaurant to itself. Nah don’t worry about us, the paying punter – whenever’s best for you, guys. The couple next to us had the right idea; peruse menu, order single dish, scoff, repeat. But could you be arsed? We’ve eulogised about the San Carlo pizza before and are happy to report that the smaller version we ordered here (£6.45), with its charred, chewy base and whack of spice on the top did the job spiffingly as well. Ravioli was a cracker: on-the-point pasta stuffed with pecorino and truffle; the lot under a heady cream sauce and a dash more truffle, just coz. Asbestos Tongue, whose palate usually requires food to be of nuclear potency for it to register, was evidently impressed, uttering – zingers, these – “mmm” and “rich”. Wise words. Being trailblazers, we brought a Tuesday Night Tea vibe to Monday Lunch by ordering the Salsiccia (£6.95) and, naturally, a portion of Truffle Fries (£2.60). 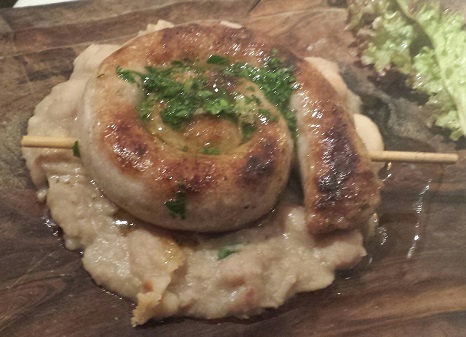 Posh sausage and chips, basically, for under a tenner. Bravo. Just missing a couple of slices of margarine-slathered Mighty White for the full effect. Salt Cod Croquettes (fiver for two) had a good bit of crunch on the outside but, (and you can have this one, Great British Bake Off,) there was a case of “claggy innards”, and nobody likes a claggy innard. Fingers were wagged when the Monkfish Skewer landed. Two bits of dry fish and the same number of best-days-behind-them prawns do not eight quid make. Tut, and indeed, tut. 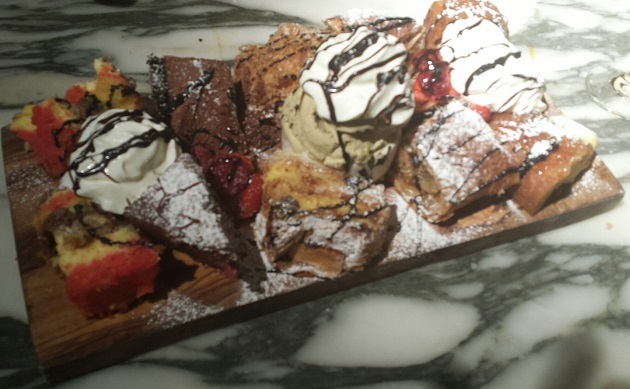 Redemption came swiftly in the form of Dolci Cicchetti, wherein for just under a tenner you get a generous selection of sweet stuff to share. We got bang-on pistachio ice cream, a layered apple tart, a kind-of vanilla slice, a chocolate torte and something, possibly tiramisu, with a spongy pink base. Bonus points awarded for excellent value for $$$. Some may call service brusque but we’ll settle for “sharp” – the place gets busy and there’s little time for idle chitchat when there’s truffle to be shaved. We’re fine pouring our own wine though, ta. 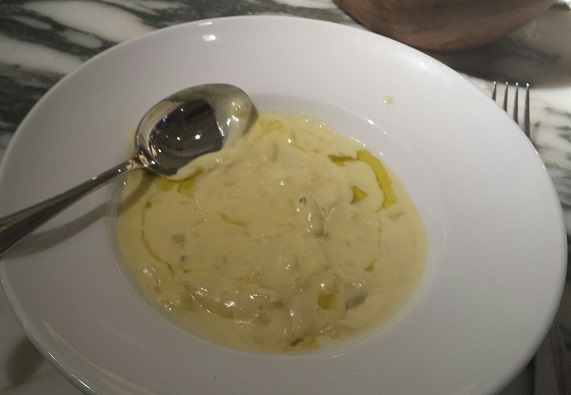 Aye, there’s some shouty theatrics and a lot of marble at San Carlo Cicchetti (“authentic” box: tick), but beyond that there’s some sound – in places quality – eating to be done.